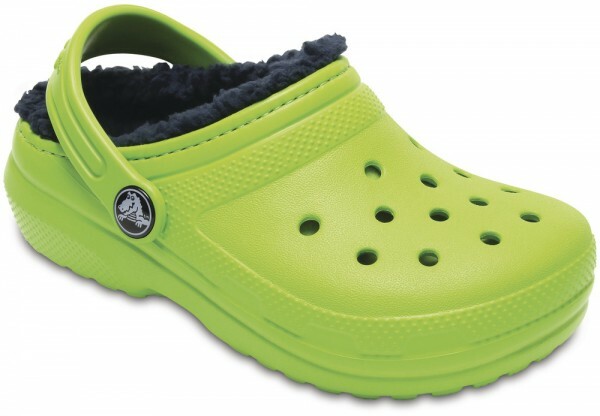 Product information "Classic Lined Clog Kids Volt Green / Navy Croslite"
Kids love the comfort of the Crocs Classic Clog  and now theres a toasty lined version to keep the feeling going all season. The soft, fuzzy liner adds to the cushion and comfort. Theyre great as slippers, yet capable outdoors, too. Croslite foam construction keeps them light and easy to wear. The pivoting heel strap gives kids a secure fit, or push it forward for an easy-on option. Dual Crocs Comfort: Blissfully supportive. Soft. All-day comfort. Related links to "Classic Lined Clog Kids Volt Green / Navy Croslite"
Customer evaluation for "Classic Lined Clog Kids Volt Green / Navy Croslite"